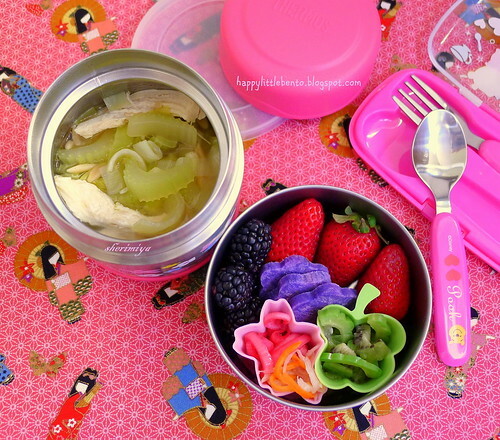 Lemony Chicken and Orzo Soup Bento, a photo by sherimiya ♥ on Flickr. I got this chicken soup recipe from Bon Appetit magazine and it went over pretty well. I substituted chicken breast meat since that was what I had, and the meat was tender. It made a pretty big pot of soup, and the family completely slurped it all up. Good thing I reserved some for the Hello Kitty thermal. The little side box holds: blackberries, strawberries, Okinawan sweet potatoes, and the usual pickled stuff. This time I added sliced kiwi in with the bittermelon, and the sweet fruit actually helps cut the intense bite of the bittermelon, if you eat both together. Unfortunately, the kiwi gets soft and falls apart in the solution, so you have to add it upon serving. I think it looks pretty. If you don't think you'd like bittermelon, I suggest you try it this way. It's not bad! Heat oil in a large heavy pot over medium heat. Add leek and celery and cook, stirring often, until vegetables are soft, 5-8 minutes. Add chicken and broth; season with salt and pepper. Bring to a boil, cover, reduce heat, and simmer until chicken is cooked through, 15-20 minutes. Transfer chicken to a plate. Let cool, then shred chicken into bite-size pieces. Meanwhile, return broth to a boil. Add orzo and cook until al dente, 8-10 minutes. Remove pot from heat. Stir in chicken and dill. Serve with lemon halves for squeezing over. is the bitter melon cooked or raw? Raw. After awhile the bitterness tones down, and the addition of fruit really helps too.